In the project I am working on, there are three professors, who is also my bosses. Two of them are consultants retired from the Chinese University of Hong Kong. It’s such a shame that I cannot find a better word (or as a matter of fact there are too many) to describe how special they are and how interesting and inspiring to work with them. Prof. Jin and Prof. Liu were the Senior Research Fellow of the Institute of Chinese Studies and Jin was the Director of the Research Centre for Contemporary Chinese Culture at the Chinese University of Hong Kong. After they retired, they decided to live in Taiwan (there’s an interesting news article about why they chose to stay in Taiwan rather than HK in China Times) and teach in the National Cheng Chi University. 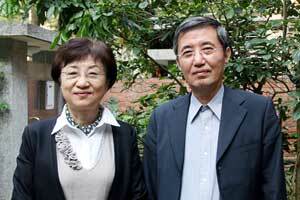 Both Prof. Jin and Prof Liu are the living legendary couple in the contemporary Chinese academia. They are basically inseparable. You google one of them, and you always find another. Both were from the mainland China, born and grew up in the communist China of late 40s. It is interesting to mention that both of them were trained as scientists in their early life, Jin studied chemistry while Liu studied physics in the Beijing University. In the Cultural Revolution, however, they became interested in humanities and social sciences and therefore published a series of work ranging from history to literature. They were namely one of those active intelligentsia in the 80s China. I have no clue how they survive the infamous Cultural Revolution and mysteriously I find little information as well. They seldom talked about it. In 1984 they published series of influential and controversial works including Towards the Future. Soon after it was banned, they were not allow to stay in the mainland China after the Tiananmen Square Protest in 1989, hence they had to live and teach in the Chinese University of Hong Kong for 20 years before they left for Taipei. Some named the two decades in HK ‘the chill-out epoch’ for the two and indicated how their works changed from politically revolutionary to relatively neutral. Nonetheless their journal ‘Twenty-First Century’ became the major forum for intellectual debate after it was launched and established their status as their status as one (or two) of the most influential scholars of the Hong Kong academia. On the other hand, the journal certainly caused the tension against the Chinese government and Prof. Jin’s name and his works remains political sensitive today.